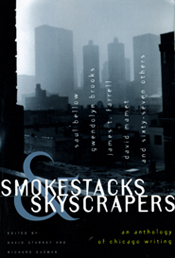 Smokestacks and Skyscrapers: An Anthology of Chicago Writing, edited by David Starkey and Richard Guzman, is the most comprehensive collection of Chicago writing ever made. Starting with the early explorer Father Marquette and the Potowatami Chief Metea and ending with the blazing, late 20th century poetry of Campbell McGrath, the book contains 114 pieces from 71 authors. It has received much praise and was a 1997 Chicago Tribune Editor’s Pick book. You can read some of of that critical praise Here. You can go to my book Black Writing from Chicago for more Chicago writing. A limited number of copies Smokestacks and Skyscrapers will be available at this site, and a BUY button will appear below when all arrangements for buying and shipping have been worked out. David Starkey and I sought not only to present the usual suspects—Gwendolyn Brooks, Saul Bellow, James T. Farrell, Theodore Dreiser, Lorraine Hansberry, Carl Sandburg, Richard Wright, etc.—but also to represent the city’s history, its ethnic diversity, its neighborhoods, even its iconic weather and places. So Albert Halper writes about popcorn and sizzling heat along the Lake front, Neil Tesser about Sox Park, not in summer, but in its winter hibernation, and Daniel Pinkwater about the gastronomic delights and dangers of an iconic greasy spoon dive. It’s music, too, as Sterling Plumpp celebrates Koko Taylor, and movies with Roger Ebert, and architecture with Frank Lloyd Wright. ♦ Go Here to see a complete list of authors included, and to access the book’s Introduction and Afterword, as well as expanded versions of the critical and biographical sketches introducing each author. This entry was posted in Chicago Writing, Writing and tagged Anthology of Chicago Writing, Chicago Writers, David Starkey, Richard R. Guzman, Smokestack and Skyscrapers. Bookmark the permalink.